I like to think of myself as a spring roll connoisseur. I’ve eaten a lot of spring rolls in my life, both good and bad. 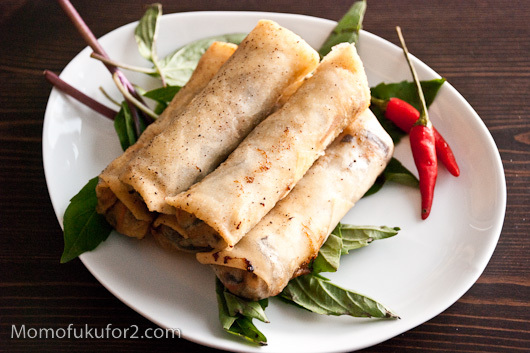 Generally, out of all the spring rolls there are in the world—almost every Asian country has their own variation—I prefer the Vietnamese variety. Most people, when they think of clay-pot chicken rice they imagine glossy brown chicken, sweet and juicy Chinese sausage, and fluffy soy-saucy rice served in a clay pot. I, on the other hand, just picture the rice cooker of my childhood. Growing up, we didn’t have a clay pot, but that didn’t stop my mom from making this traditional Chinese dish. 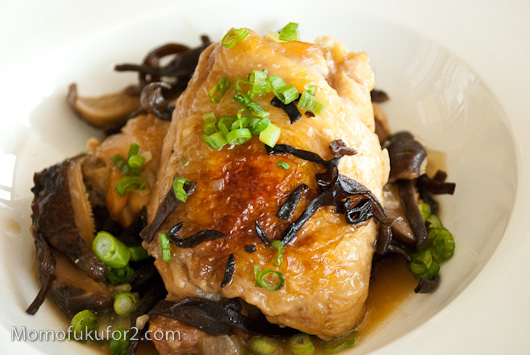 Instead of a clay pot, she’d cook everything in the rice cooker for a fast, one pot meat of tender chicken, sweet sausage, earthy mushrooms and soy-sauce-soaked rice. 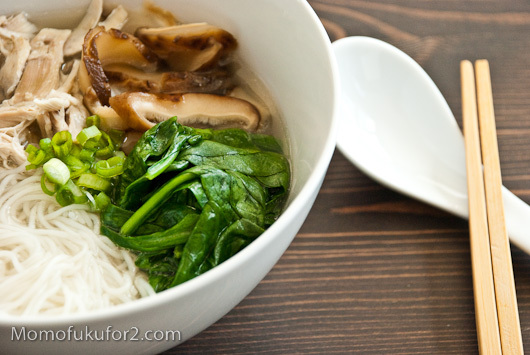 Chinese people, especially more traditional ones, are very particular with soup. My dad used to be one of those people, but he’s mellowed out a lot. Before, he used to demand that my mom boil him soup daily. Sometimes, if my mom made a big enough pot, we’d have leftover soup from the night before, but when we did, my dad would grumble. He’s less crotchety now, even though he’s older. You’d think he’d become more particular while growing older, but instead he’s definitely more relaxed. After making ramen broth I had a lot of left over shiitakes that I saved to pickle. 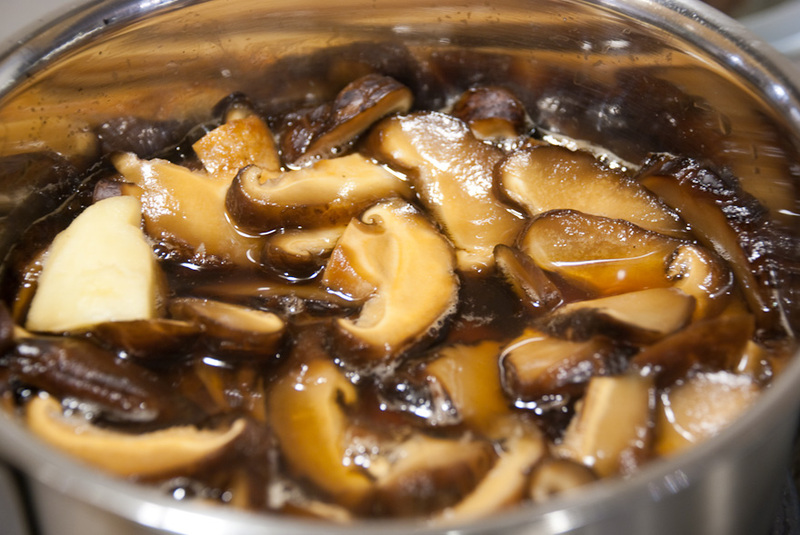 The soy sauce pickle recipe is pretty self-explanatory, the mushrooms are pickled in soy sauce. 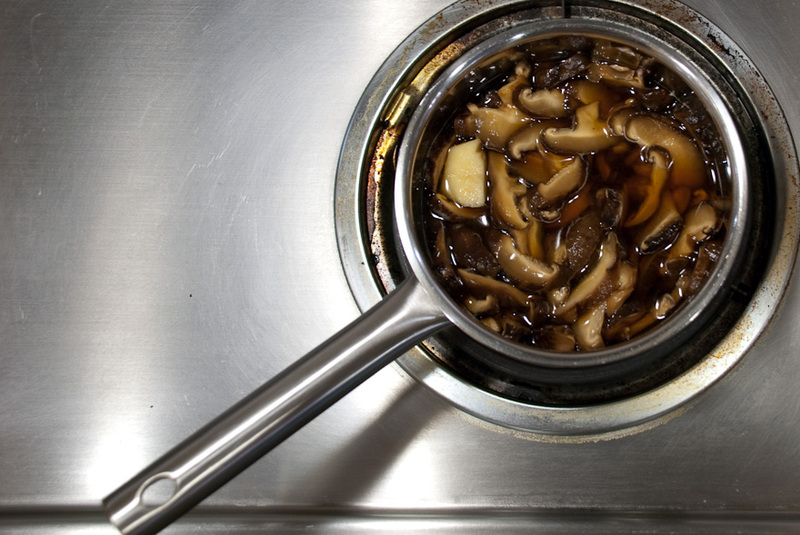 Sliced mushrooms are boiled in soy, sugar, sherry vinegar and ginger to add a bit of freshness. 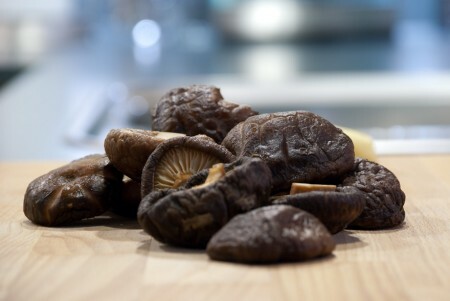 Remember to let your mushrooms cool down before you eat them, the flavours are much better when they’re cool. These taste great on their own or you can on put them on top of some rice for a quick snack. Good broth is the key to good ramen. It should be sweet, salty and robust. I was pretty excited about making the broth, which was a good thing because it ended up taking over 8 and a half hours to finish. 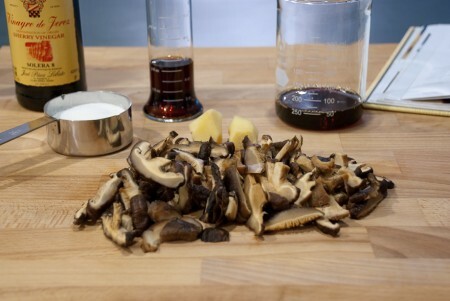 Momofuku ramen broth is made with konbu, shiitake mushrooms, chicken, pork, bacon, and taré. I started by putting two pieces of konbu into my biggest pot. With the seaweed happily expanding, I tossed in some dried shiitakes. I love shiitakes, fresh or dried. They have a delicious earthy umami smell, but not everyone agrees. Some people like the taste but can’t stand the smell, like Mike. Isn’t that just like how people don’t like liver but love foie gras or paté? Hello, it’s all liver! 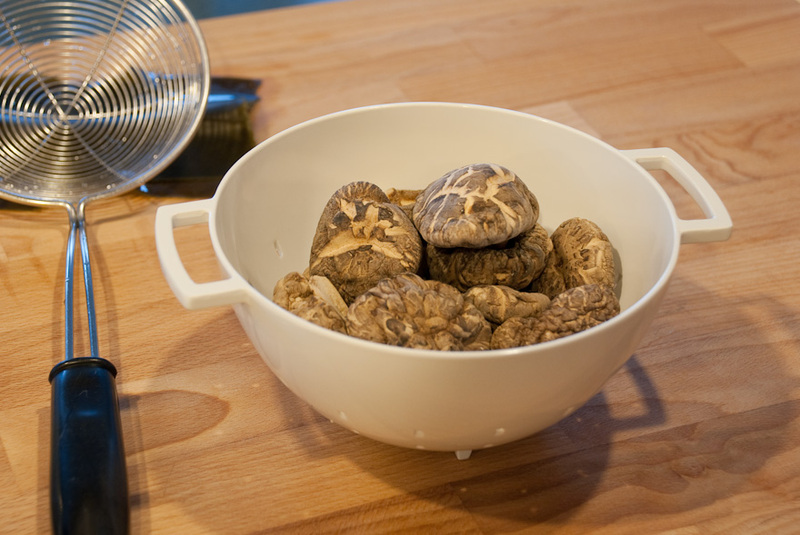 Or in this case, all mushrooms! Speaking of mushrooms, I hope you like them because with this recipe, you’re going to end up with a lot of “spent” ingredients that were just used for flavour. Strain out the mushrooms and add your chicken to the pot to simmer until the meat pulls away from the bones with ease. The chicken was nice and tender with a clean flavour, so I saved it. It doesn’t mention what’s done with the leftover chicken in the book, but I didn’t want to throw away 4 pounds of chicken meat! 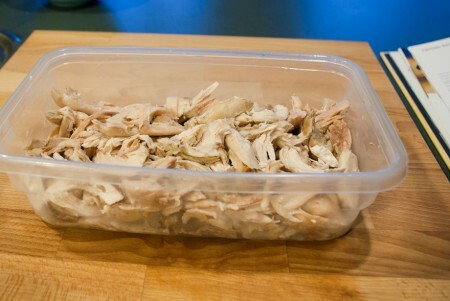 After straining out the chicken, some meaty pork bones are roasted and added to the broth. This is also when you add your bacon for some smoky pig flavour. The bacon is strained out after 45 minutes. I didn’t know what to do with the boiled bacon so I threw it away even though it made me sad inside. I know, I know, I threw away the bacon and kept the chicken. I’m crazy like that. But trust me, boiled bacon is not a good thing. Looking back, I should have tried to crisp it up and eat it for a snack. After all that adding and straining, it’s simmer for another 7 hours with the pork bones still in the stock. For the last little bit, add the vegetables and then strain those out too. Finally, success! Well…no. There was one little problem: The recipe yield was 2 quarts, but somehow I only ended up with a little over 1. The simple solution? Add more water. I was worried that adding water would make the broth less porky, but it turns out I just concentrated the broth. 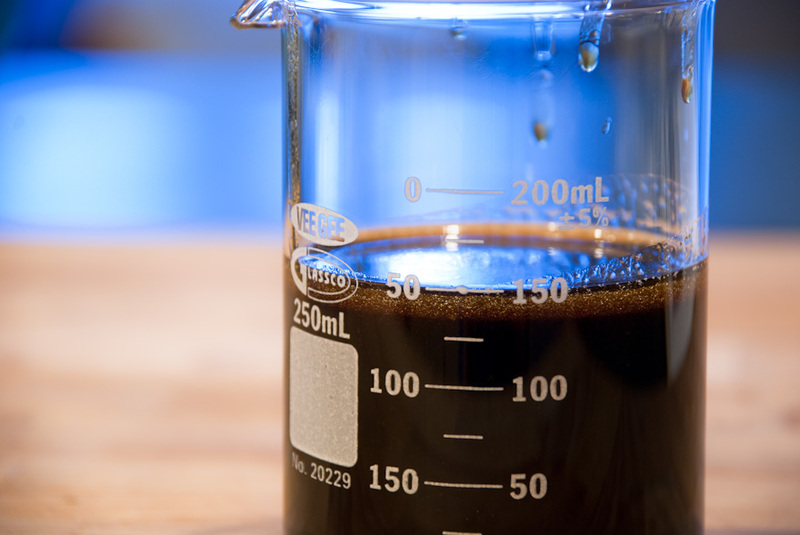 It was kind of a “duh” moment, because the cookbook actually suggests boiling it down for space-saving purposes. 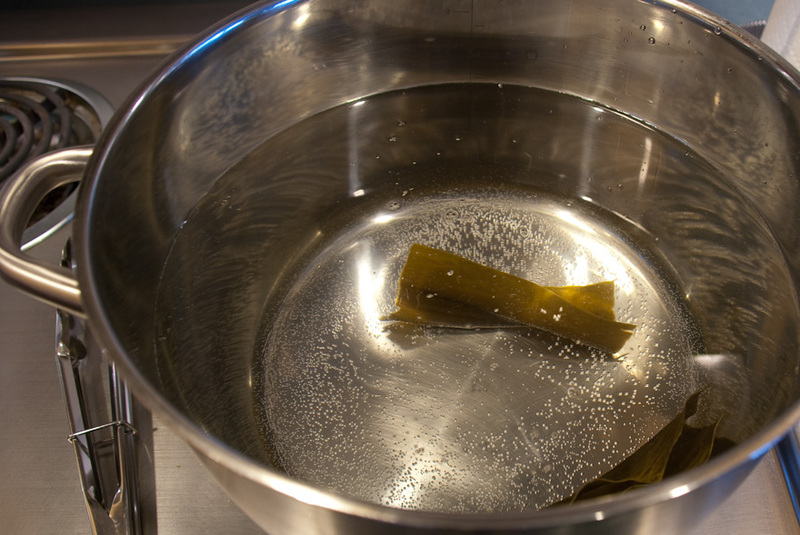 Anyway, I strained it yet again, added some more water, seasoned with the taré, and took a quick taste: success! It was smoky, porky, and delicious. There was a definite luxurious feel to it, possibly because of the copious amounts of meat used. Worth it? Oh yes.